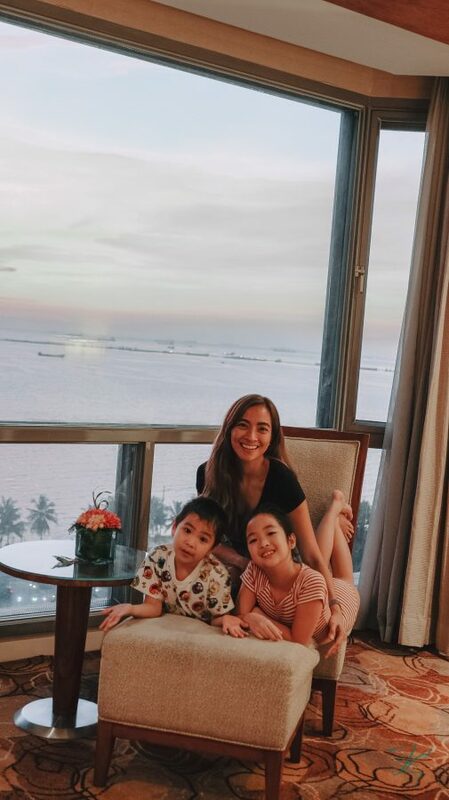 A few months ago we did a quick staycation at New World Manila Bay. Initially I planned to do a vlog about it and even let my kids use the GoPro so I can add footage they took. Unfortunately upon checking the videos that we took, the audio was inaudible and the device kept on producing this annoying sound. Huhuhu. I tried to salvage some clips but the videos didn’t have enough stability to make it viable for creating a vlog. 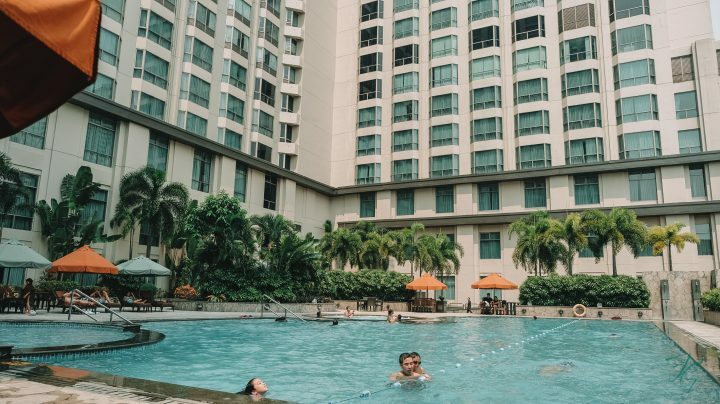 Thankfully the blogger in me was able to take a few photos during our staycation. We stayed at the Premier Bayview Suite. It was a beautiful one bedroom suite with enough room for my kids to play hide and seek! 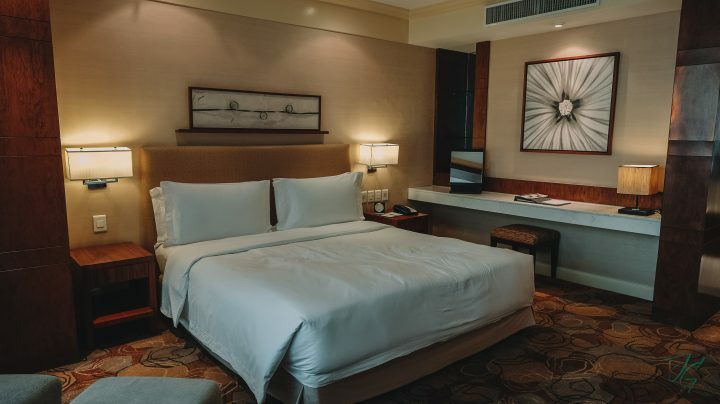 The room was so inviting and spacious enough to add an extra bed. Also love the bathroom. 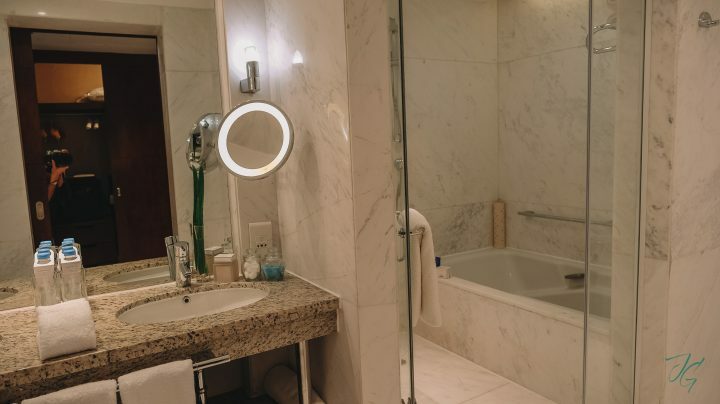 It has double sink and a separate tub and shower. Sweet treats welcomed us in our suite. 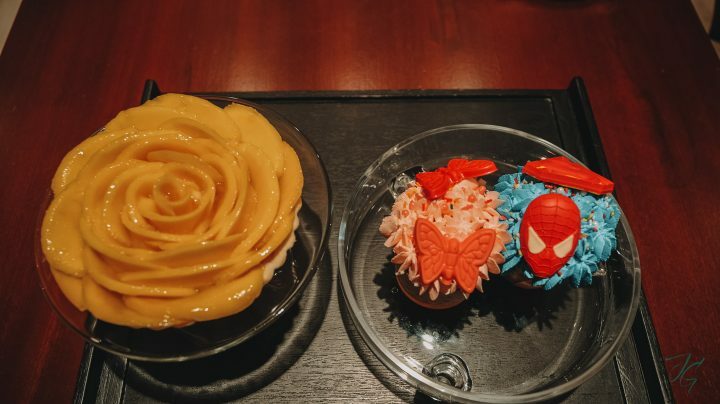 Cute cupcakes for my kids and a big mango pie for my husband and me. Back story, I drove to New World in Makati instead of Manila Bay. Yikes! Because of this setback we arrived at New World Manila Bay a little past 5 in the afternoon. 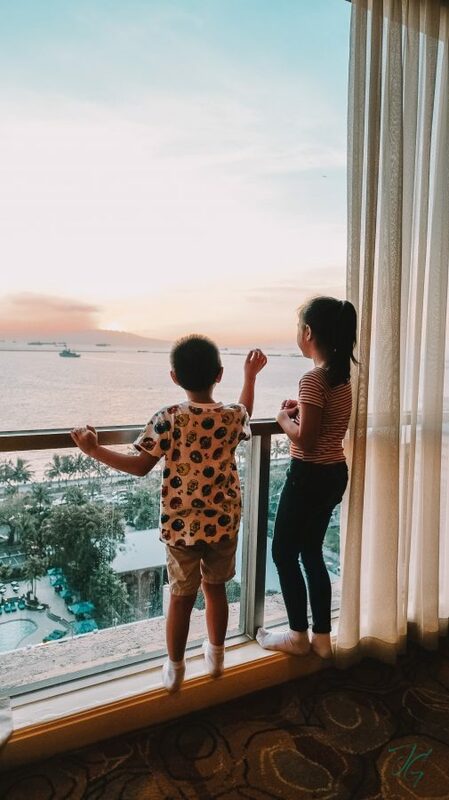 We settled down and enjoyed the view from our room–it was facing the bay and so we got to enjoy us a sunset. 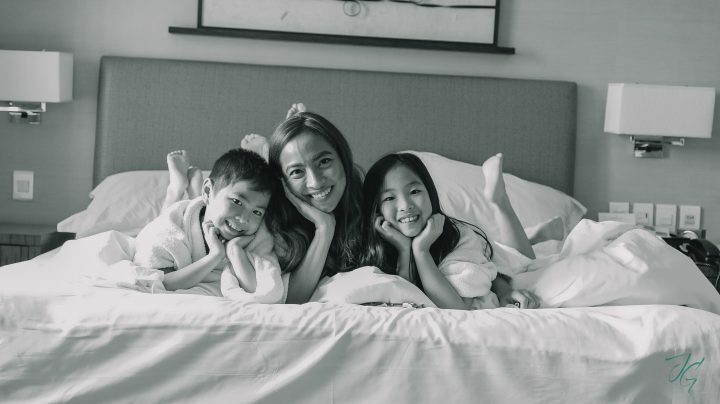 More silly moments with these two before we got ready for dinner. But first we had our pre-dinner cocktails at the Residence Club. 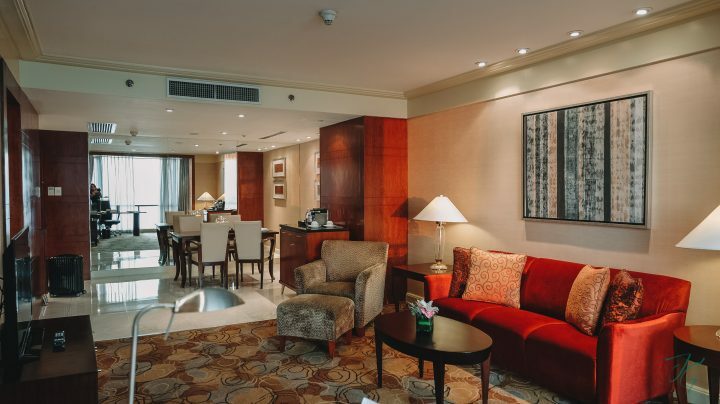 When you stay at New World Manila Bay in a Residence Club Room or Suite, you get to check in and check out at the Residence Club and enjoy pre-dinner cocktails among other privileges. 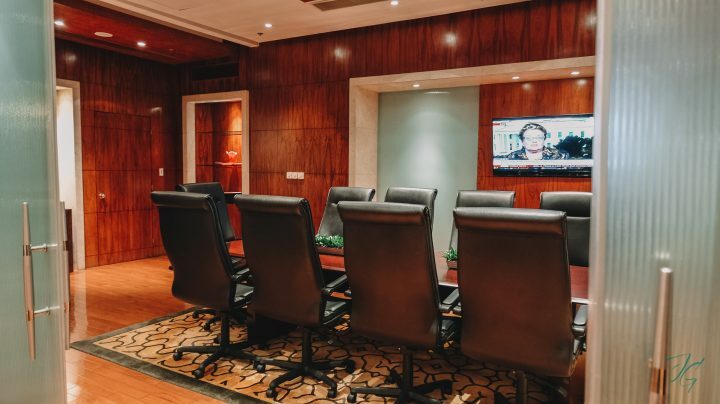 There’s even a conference room that you can rent should you need to set up a meeting while you’re staying at New World Manila Bay. 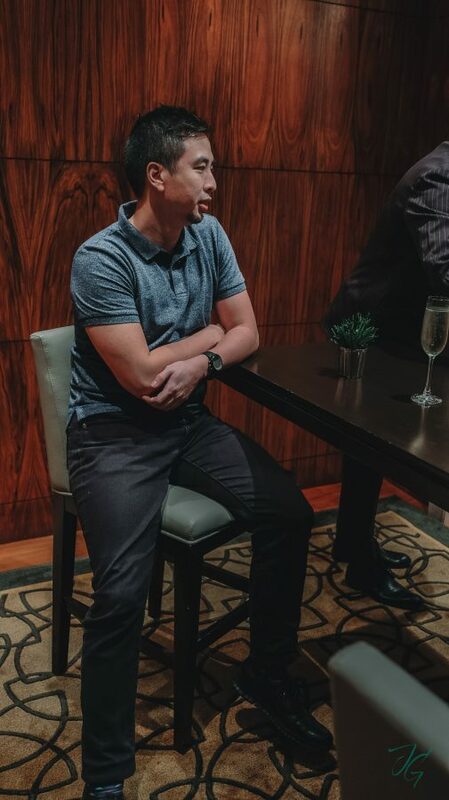 Mr. JG waiting for his drink. 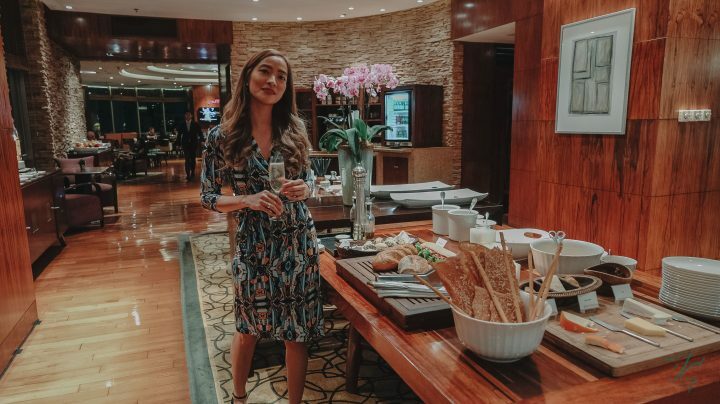 While here I am with a bubbly in hand and a standing by the assortment of canapés and appetizers heehee. Market Cafe offers different stations from Western, Japanese, Chinese, Korean and Filipino. There’s also cooking stations where you can have your meat or seafood cooked the way you want. I thoroughly enjoyed crab, steak, Japanese and dessert! 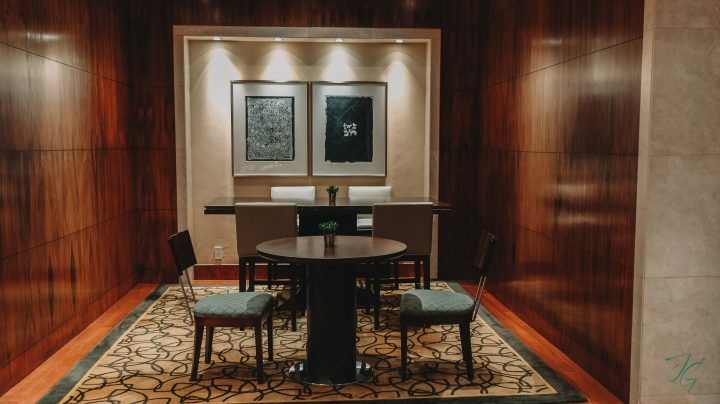 This month classically-trained Korean Chef Airween Verso presents an authentic course of regional Korean specialties at Market Café. 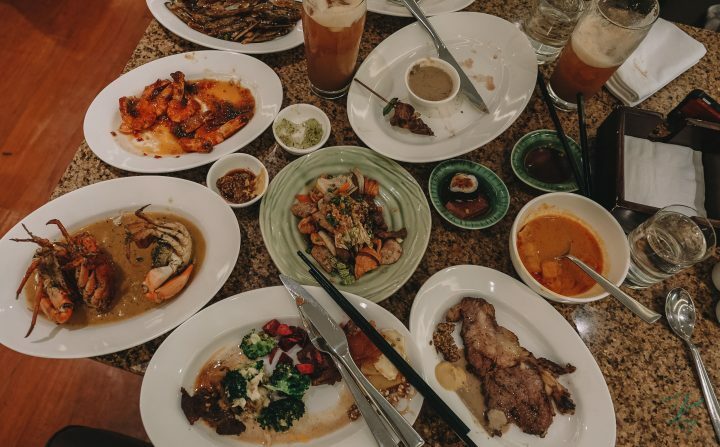 Awaken your taste buds with treasured Korean dishes such as heamul pajeon, yangnyeom chicken, kimchi jeon, galbi jjim, Korean barbecue, and more. Available for dinner from Monday to Thursday and for lunch every Sunday. Rates start at PHP 2,500. Club Epicure members enjoy 50% off. Woke up early to head to the gym to clock in my usual gym-first-before-breakfast-buffet ritual. 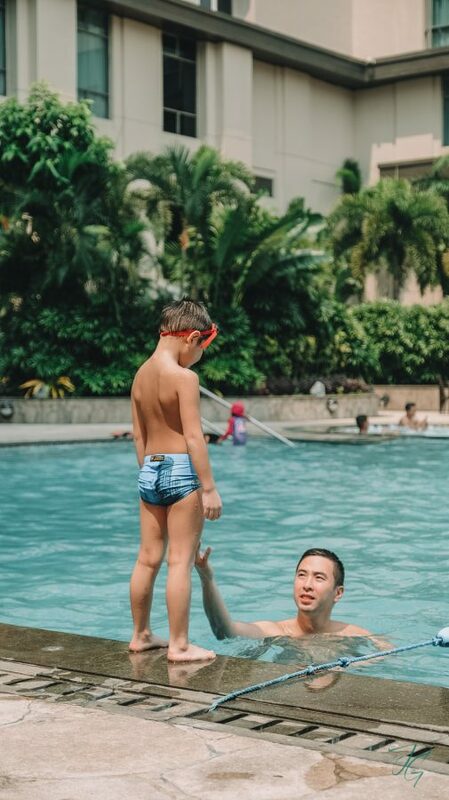 Then we headed straight to the pool for some water time! 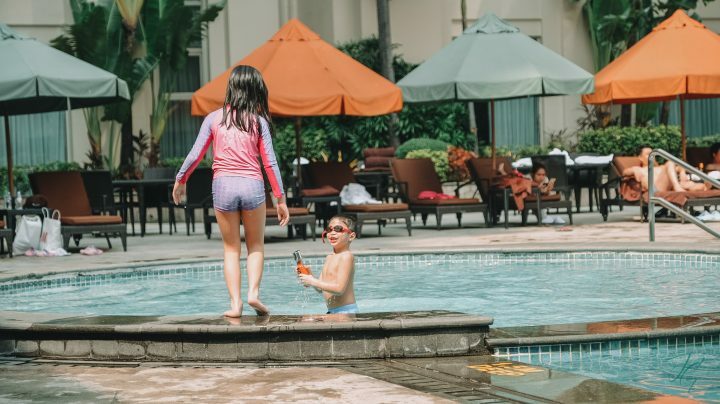 My kids like swimming so much one of the things they look forward to whenever we stay at a hotel is swimming time and New World Manila Bay’s pool got two thumbs up from my kids. 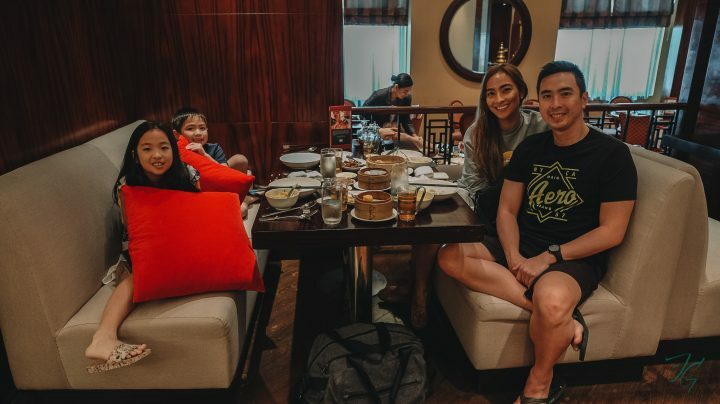 After pool time we had lunch at Li Li, New World Manila Bay’s Chinese restaurant located on the 5th floor. We love the cozy interior but more than that we love the food! We had the unlimited dimsum so we were stuffed with dumplings & the like. I forget the names of the dimsum we had but most of them were the best I’ve ever had! Unlimited Dim Sum at Li Li is from 12 noon to 2:30 p.m. Monday to Sunday with a rate of Php 1,088 net per person. Ended our stay by enjoying a bubble bath and taking a nap before checkin’ out. It was truly a relaxing staycation! 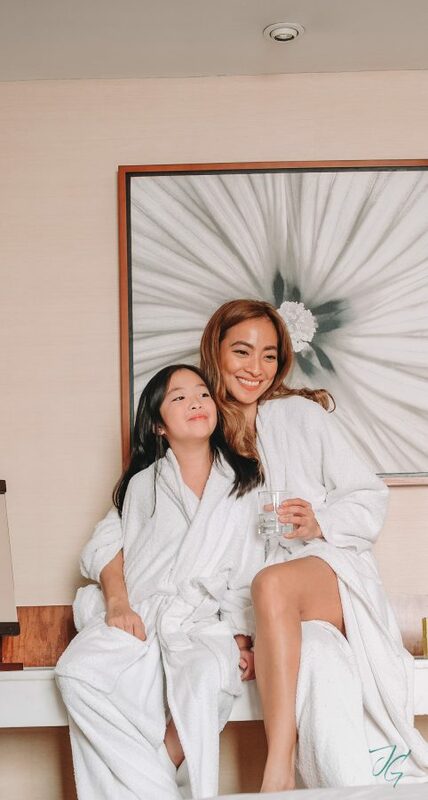 From March 1 until April 30, travelers can book the Local Discovery Room Package on the hotel’s website, https://manilabay.newworldhotels.com, and enjoy the following privileges when availing the offer with a minimum 2-night’s stay: Local mango and hibiscus-infused drink for two (2), room accommodation in a Residence Club room, exclusive access to the Residence Club Living Room with daily breakfast and evening cocktails, 75-minute traditional Filipino hilot treatment at The Spa at Club Oasis, and discounts at Market Café, Li Li, and The Fireplace.